How to send a message to the messengers of the future? Create a product that tells a story – literally and figuratively. Timbuk2’s virtually indestructible bags have made them the choice of messengers for years. In 2005, Avantgarde saw an opportunity to take this current client and broaden its audience and social responsibility efforts. It all started with landing this eco-minded company over the shoulders of different kinds of movers and shakers: TED’sters. Every year, the TED Conference, coined as “summer camp for the brain,” draws together over 1,000 thought-leaders in technology, science, business and the arts. One of these visionaries is William McDonough, Sustainability Architect and co-author of Cradle to Cradle. After attending McDonough’s TED session, Timbuk2’s CEO was inspired to practice what McDonough was preaching. That’s where Avantgarde came in. We brokered a relationship between Timbuk2 CEO, Mark Dwight, William McDonough, and another luminary we knew to be embracing the C2C movement: publisher Charlie Melcher. Our plan was more than just a meeting of the minds; it included a fully fleshed out collaboration for TED2006. 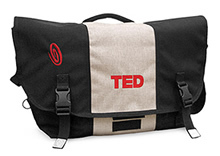 We produced a Timbuk2 TED2006 messenger bag for each conference attendee, specially manufactured with environmentally friendly materials, making it the first ever Cradle to Cradle softgood. The bag’s eco-efficient design not only told a story on its own, but also included a 20-page booklet that we conceptualized, edited and designed. The story told inside, co-authored by Dwight, McDonough, and Melcher and edited by Avantgarde, showed how each company is making the world a safer, cleaner place – one bag, building or book at a time. As always, our strategy laddered up with other carefully crafted initiatives, including a cause-related marketing campaign and construction plans for Timbuk2’s first retail store. A thousand of the smartest people in the world not only read about the sustainability movement – but they were able to carry an example of its successful implementation over their shoulders. Best of all, this highly influential group now recognizes Timbuk2 as a company at the vanguard of an important crusade. Shortly after the conference, Timbuk2 was commissioned by Advanced Micro Devices to make sustainable bags for their top managers, who work tirelessly to bring computers into third-world countries.